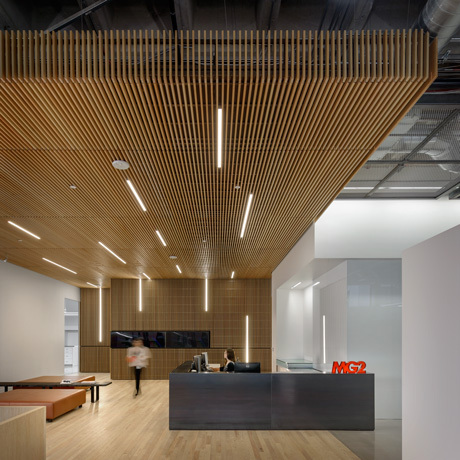 MG2’s Aireen Wong and Kelly Brainerd recently attended NeoCon 2015, the largest architecture and design expo and conference focusing on commercial, healthcare, hospitality, and educational interiors. Colorful accents are nothing new to commercial interior design, but the palettes seem to be changing. Previously, we saw a focus on “corporate,” branded, and primary colors. 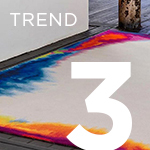 Now, interior colors are becoming much more playful and mirroring trends in fashion. From the preppy pastels of a Ralph Lauren® polo to the bold neons of a pair of Nike Flyknits, all color is fair game in the right application. 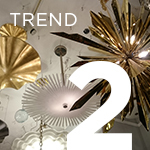 Another trend permeating design from the fashion world is the resurgence of metallic tones. Many of the NeoCon vendors were showcasing touches of glitz from high-sheen fibers in carpets to foil wallcoverings and metallic furniture finishes. For quite some time silver tones were in favor, but there is a continued reemergence of gold, brass, and copper and a propensity to mix metallic finishes. As technology becomes part of every facet of our lives and as the popularity of modern design endures, the contrast created by handcrafted materials continues to be compelling. Nostalgic materials like crochet and patchwork fabrics are being presented in a polished manner that almost seems “accidentally chic.” Watercolor and painterly designs were also a consistent theme across textiles. Particularly in commercial design, these type of artistic elements, such as carpet planks with smooth, ombré transitions, can bring a softer feeling to a design. 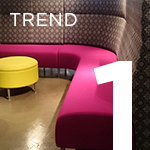 In contrast to the many soft and sketchy patterns showcased at NeoCon, we continue to see a variety of geometric forms, particularly in acoustic panels and textile patterns. We also saw flat wallcovering products designed to create the optical illusion of a 3D geometric effect. Many of these geometric designs are being showcased in fantastic bright colors or pure white to create eye-catching focal points or a dynamic play between shadow and light. 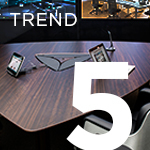 As mobility and constant connectivity become the workplace norm, there has been a clear shift toward bringing the design comforts of home into workplace design, from textures to technology. 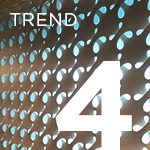 This shift continues to influence product design and this year the heightened demand for technology integration was evident. We’ve seen furniture with built-in connectivity or charging stations in the past, but new products include these features in even more harmonious ways.